The second release from Dirigeable Records is a pleasing throwback to 60's AM pop. It is also reminiscent of former Elephant Six pop geniuses' The Minders. So, it should come as no surprise that The Minders front man Martyn Leaper engineered and produced The Arthurs at his studio in Portland, Oregon. The outcome is a delightful, hook-laden pop album that will have you tapping your feet and bopping your head to the undeniably infectious golden era of pop that The Arthurs toy around with. From warm vocal harmonies to bouncy beats and sweet melodies, these kids know what they're doing and they also know how to have fun. Walking in the Sunlight is filled with fun. From the opening track ("Sunlight") through track twelve ("Hours, Eyes Closed"), they keep you focused, entertained, and wanting more. 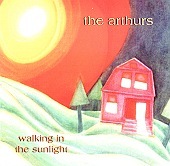 Twelve songs in under thirty six minutes, The Arthurs' three minute delights come in and stay only long enough to drive you wild, before the next hook-laden piece comes your way. I'll give this an A.